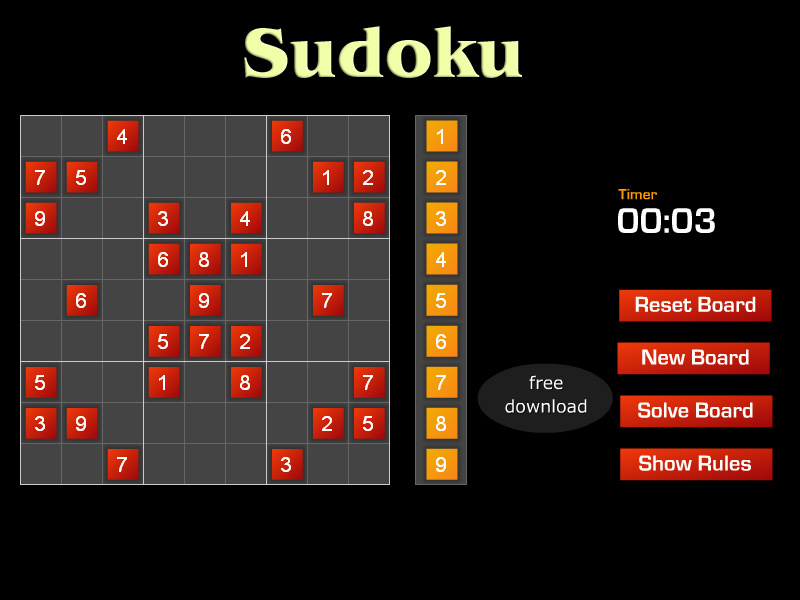 "Sudoku" is a free online logic game to fill a 9x9 grid with digits. Play Sudoku online on computer. Paper and pencil logic game. Fun logic learning game. Fill in all the empty squares without using the same numeral twice in each column, row, or box, and without changing the numerals that are already in the grid. Drag and drop the orange squares and fill in all the empty squares without using the same numeral twice in each column, row, or box, and without changing the numerals that are already in the grid. Detailed rules are described in the Class subjects section. Know how to win a Sudoku game. Sudoku (sudoku) (sometimes spelled as Su Doku, but also called Number Place or Nanpure) is a puzzle that is very popular in Japan. It was created in Indianapolis in 1979 by Howard Garns and it appeared in Dell Magazines afterwards. 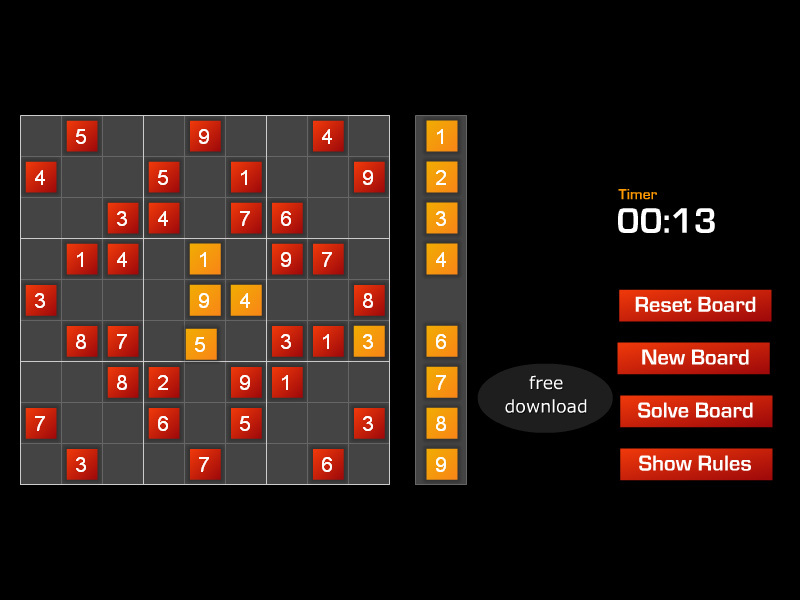 Sudoku puzzles are solved by logic and no math is required. As seen on the right, it consists of a grid which is usually made up of nine rows, nine columns, and nine boxes that are separated by thicker, darker lines. Some of these boxes will contain numerals from 1 to 9. To solve the puzzle, a person must fill in all the empty squares without using the same numeral twice in each column, row, or box, and without changing the numerals that are already in the grid. These puzzles were created to be done using pencil and paper, and there are many books that contain collections of these puzzles with tips and strategies for completing them. They also appear in newspapers and magazines: typically, a different puzzle appears every day and the solution is printed somewhere else or in the next issue. Later, small handheld machines were created that generate Sudoku puzzles for the user to solve. More recently, though, the game can be played on the Internet or on mobile apps. Labels: Paper and Pencil Games , Puzzle Games , Learning Games , Logic Games , Education Games , Free Online Games.